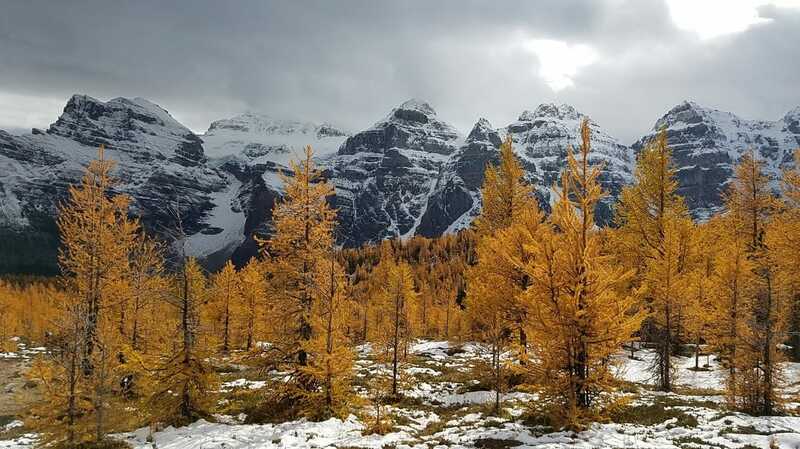 This would be the one trip I did in 2016 where I got to see larches in their prime! 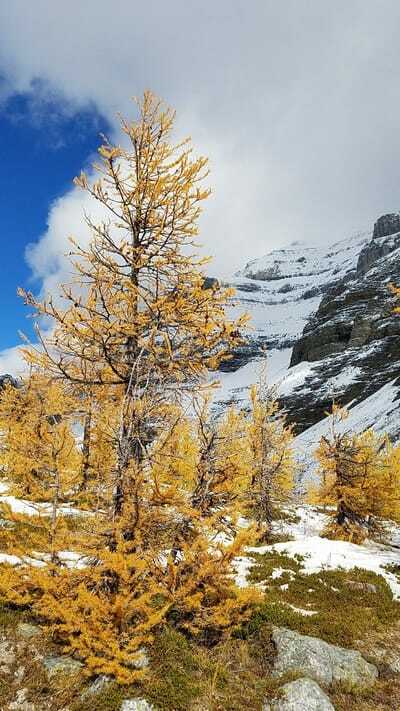 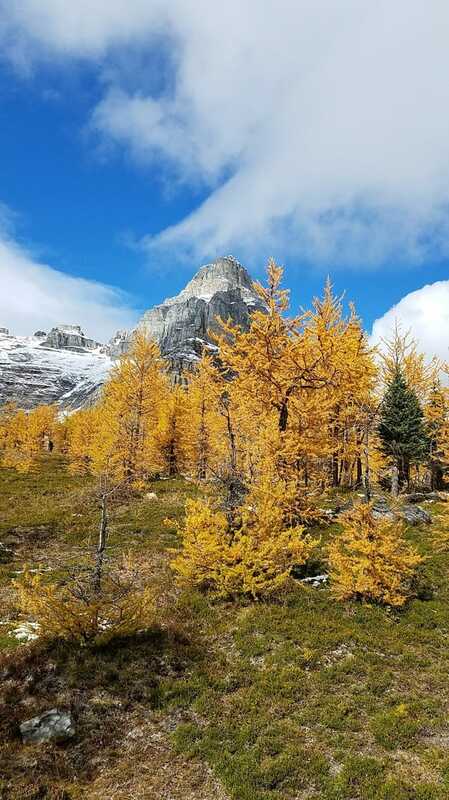 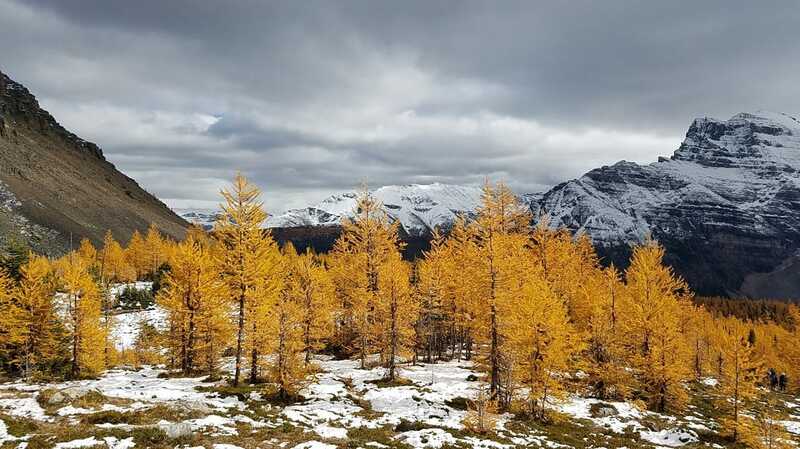 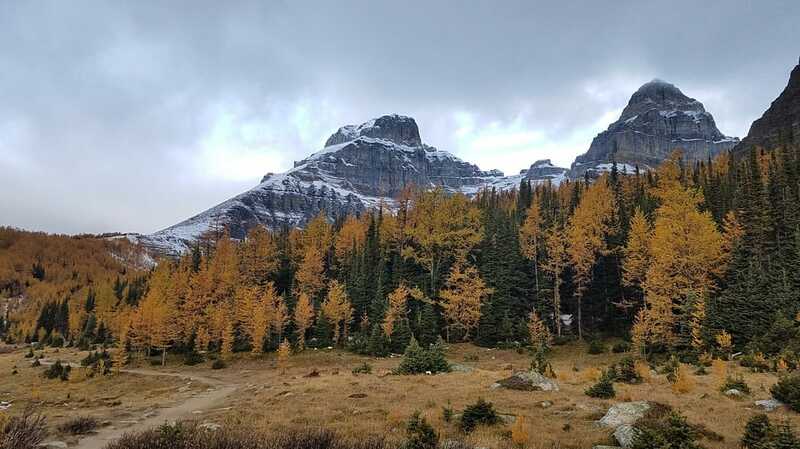 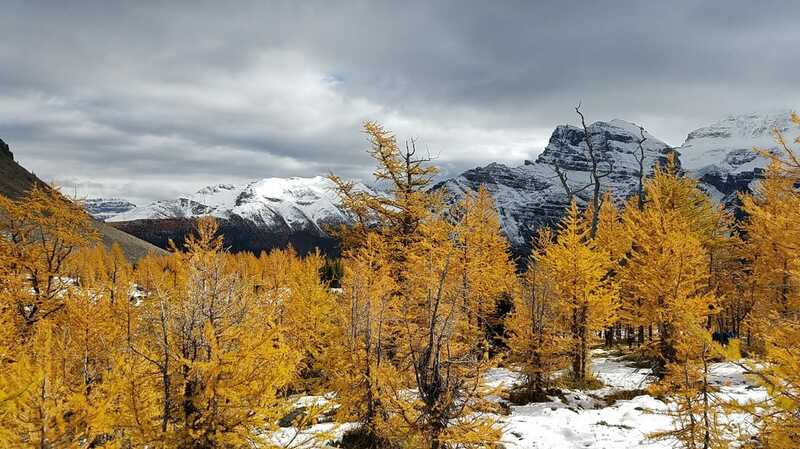 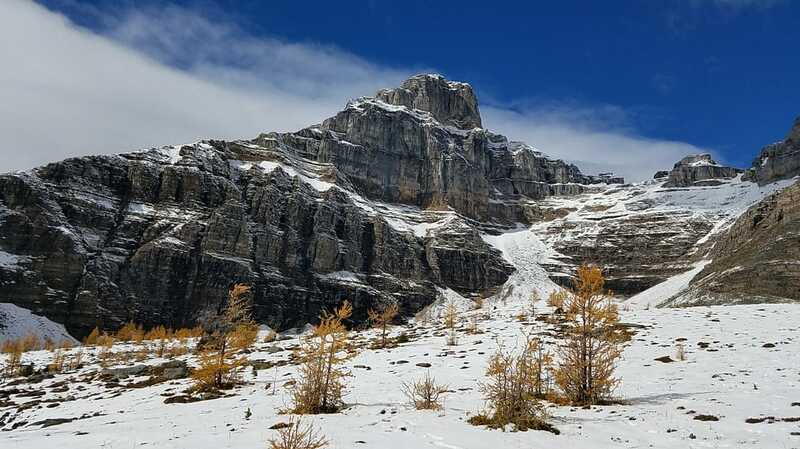 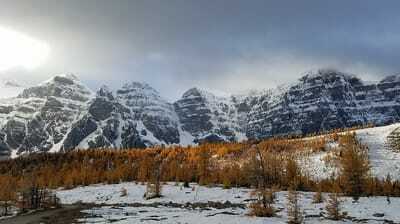 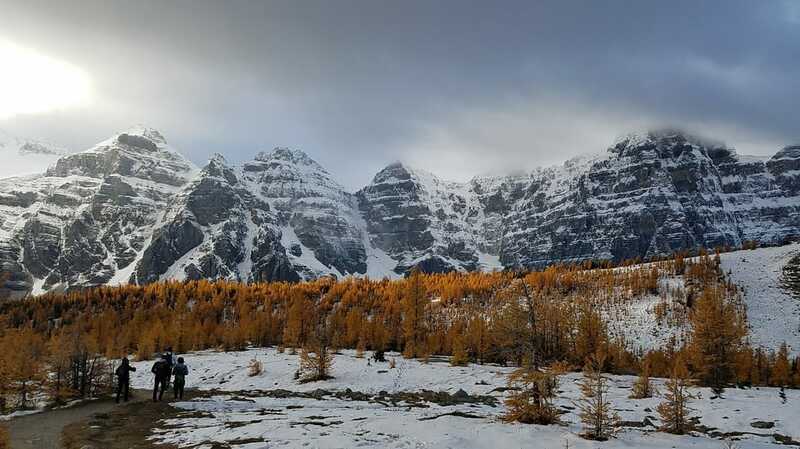 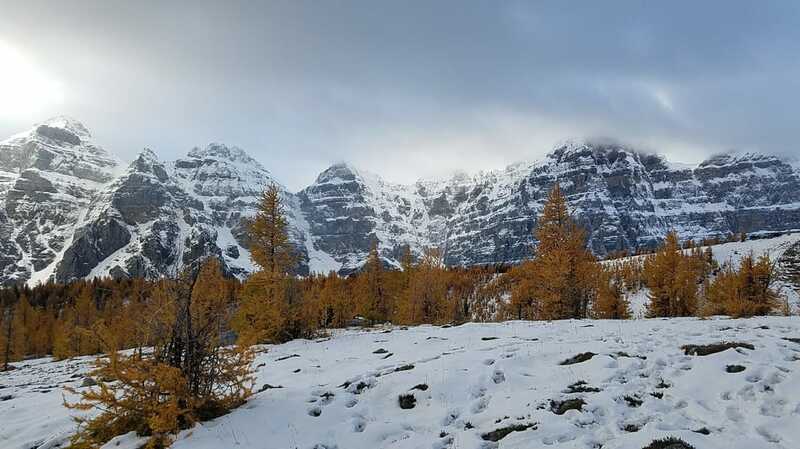 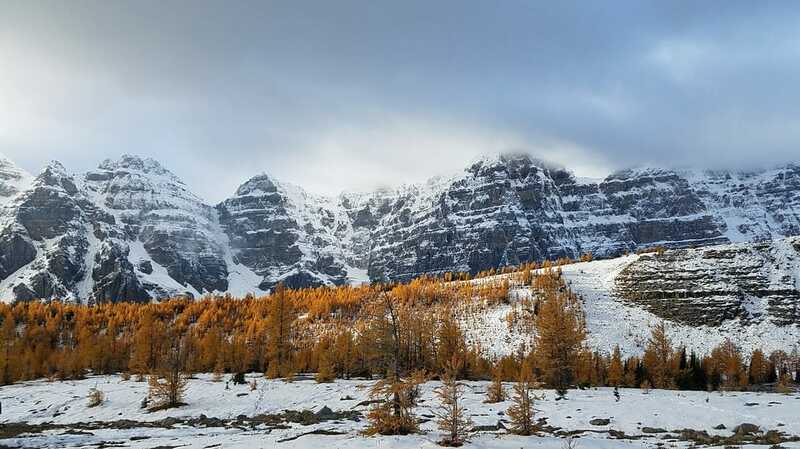 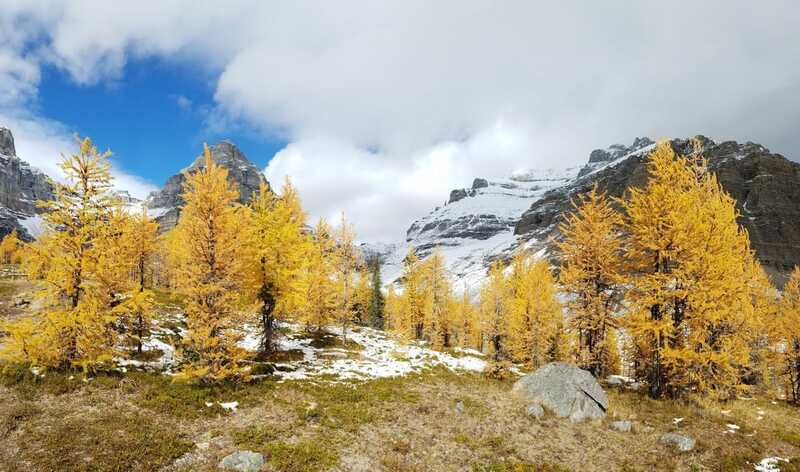 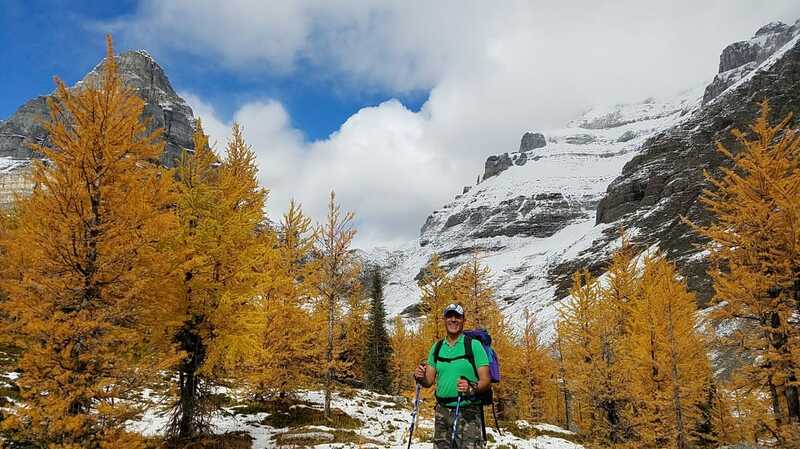 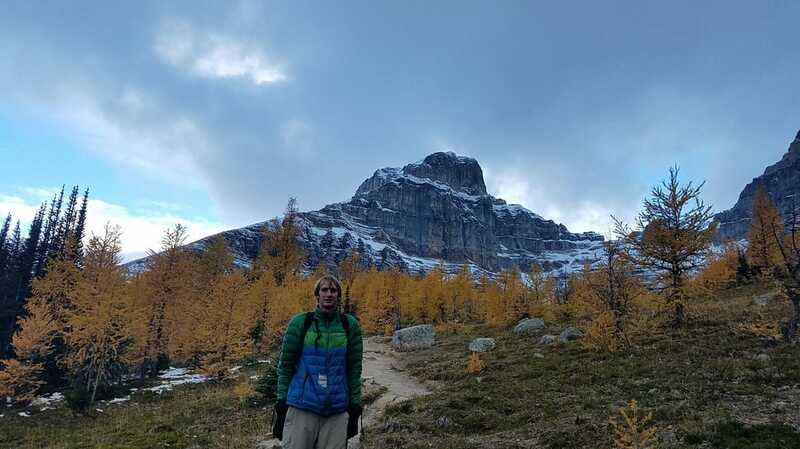 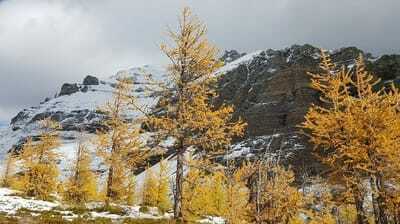 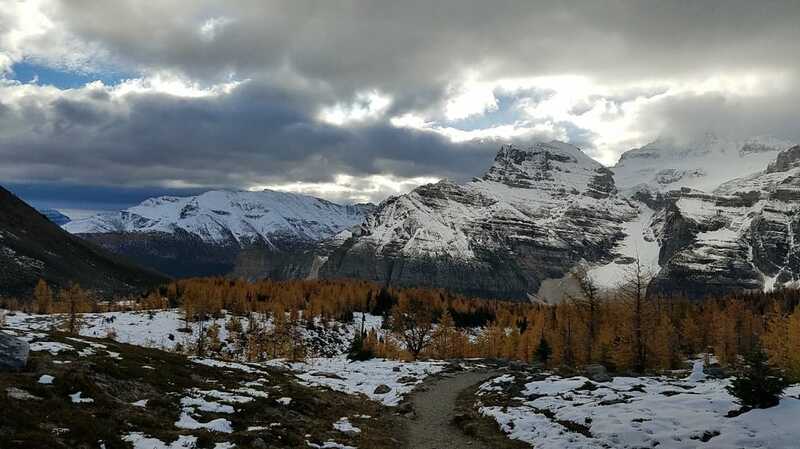 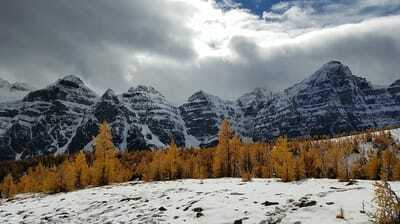 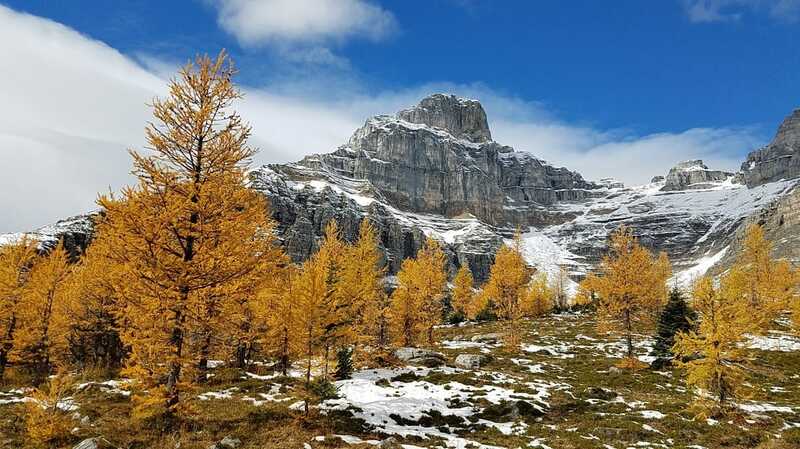 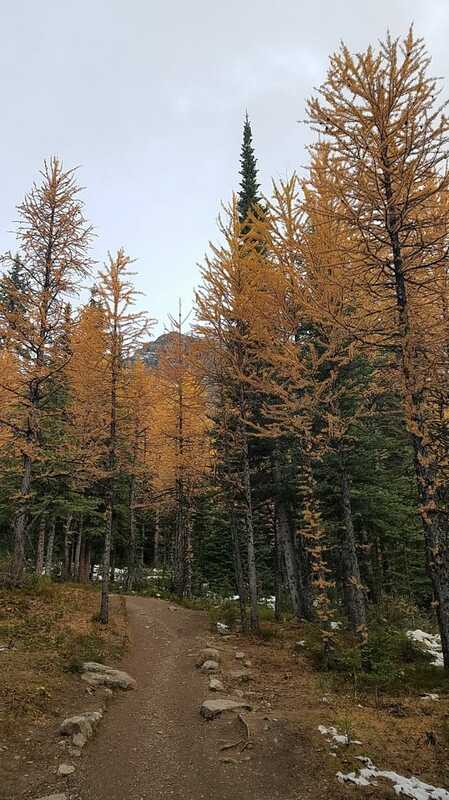 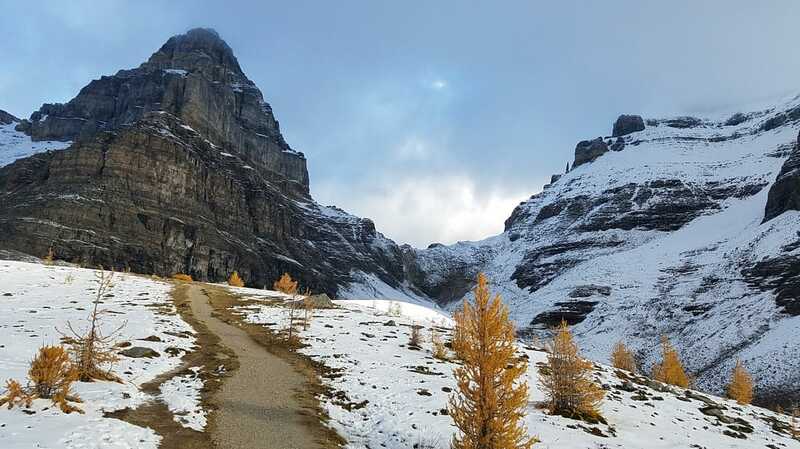 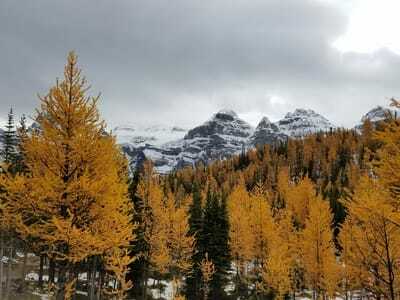 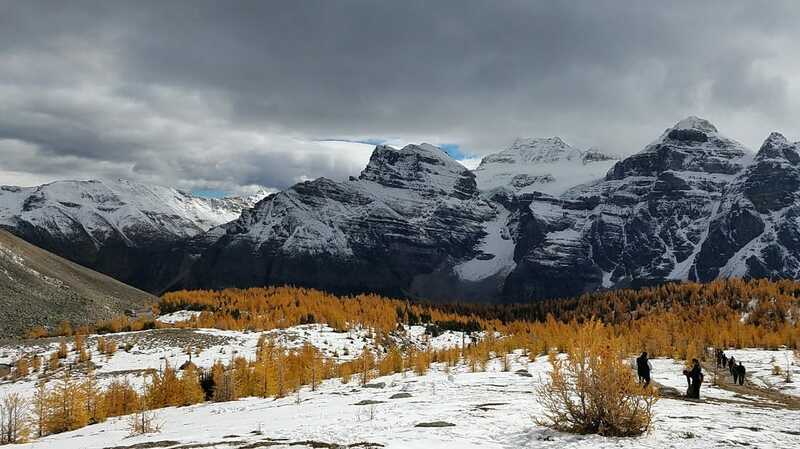 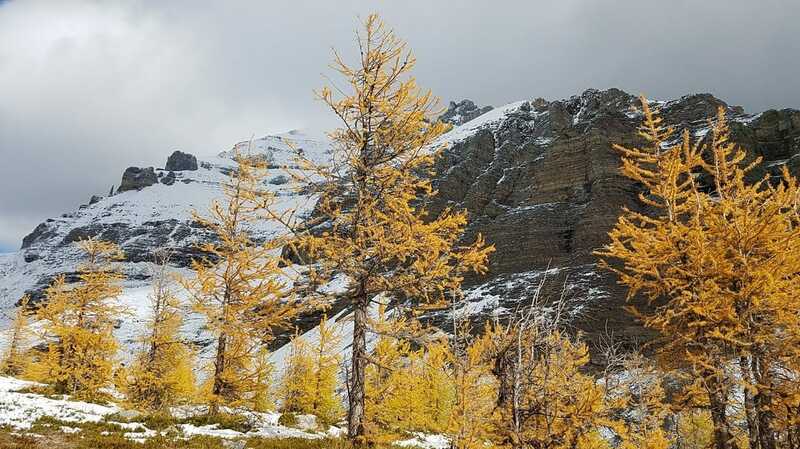 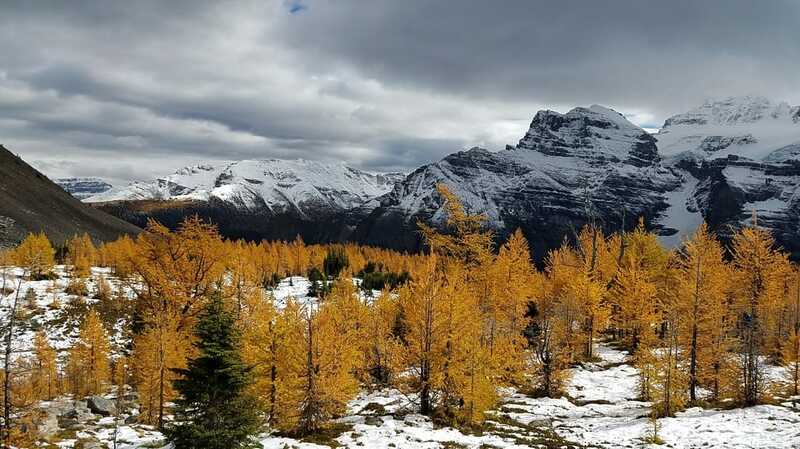 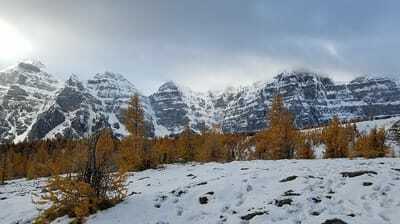 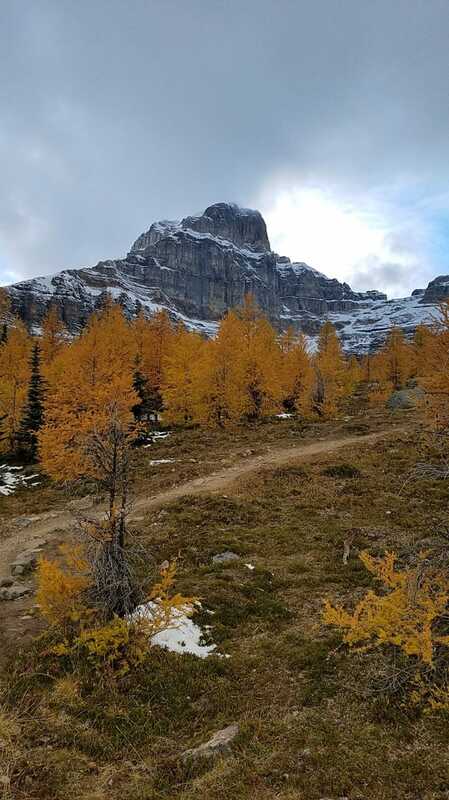 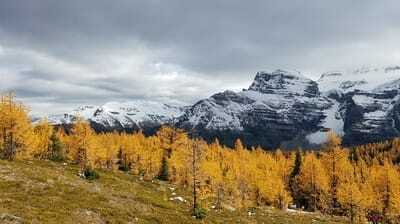 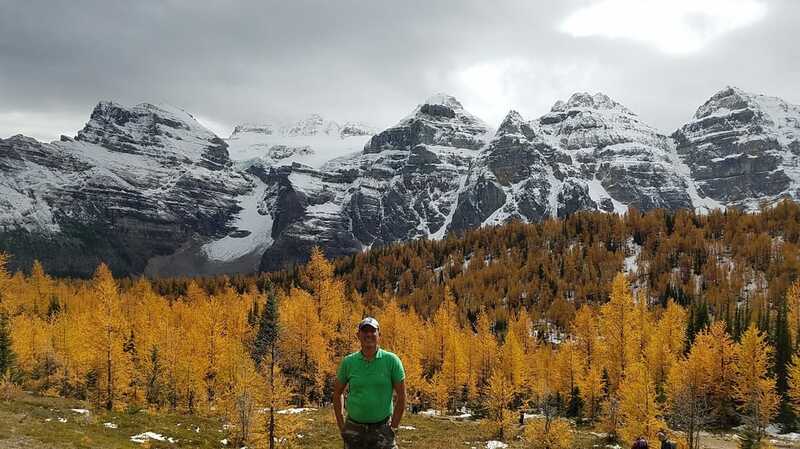 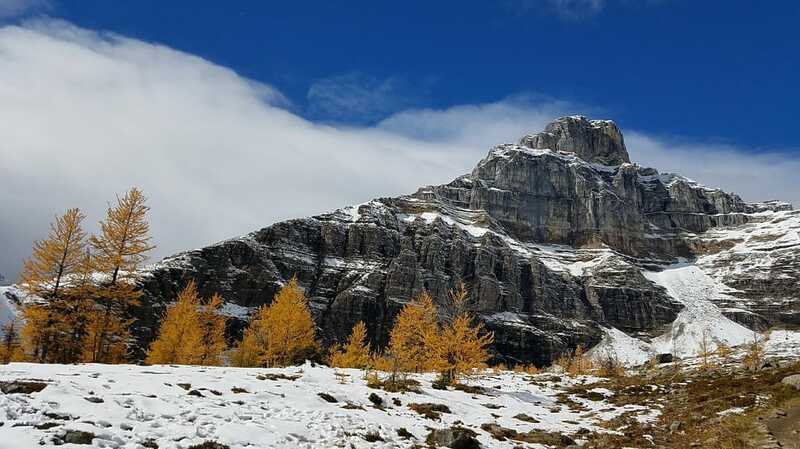 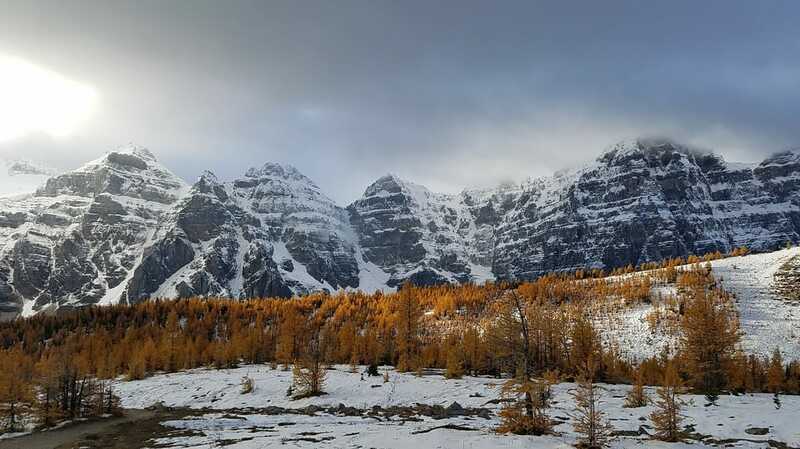 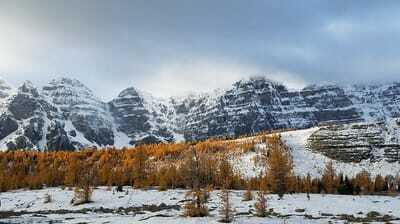 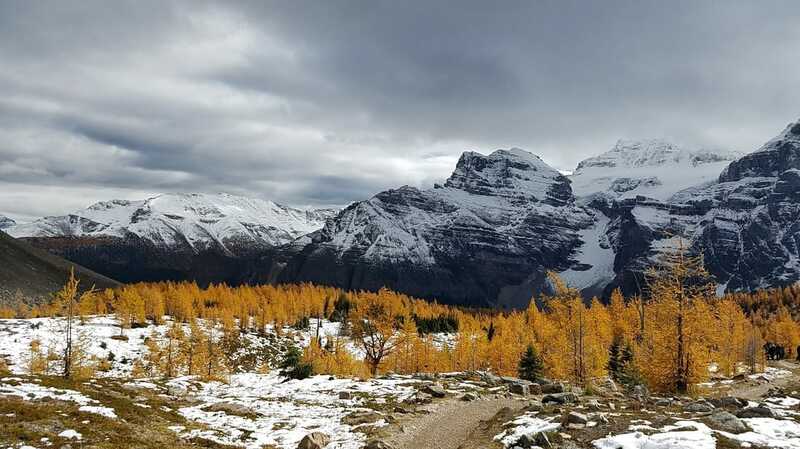 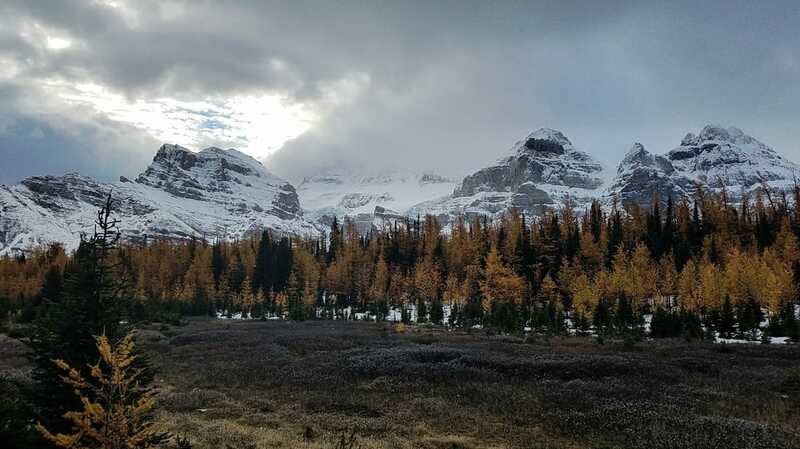 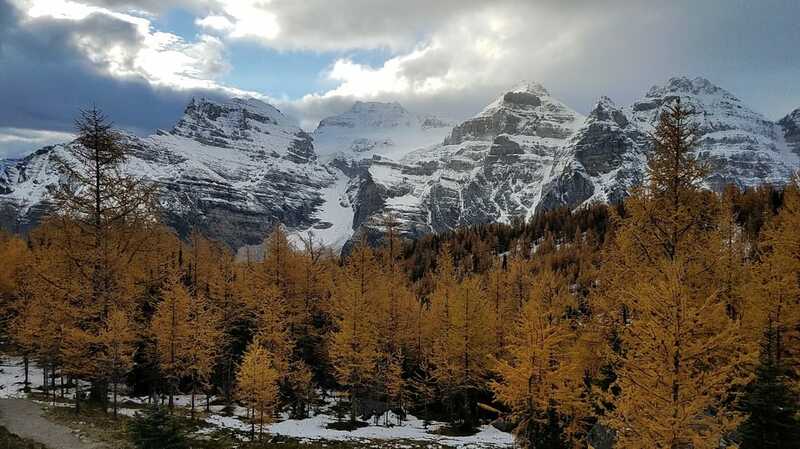 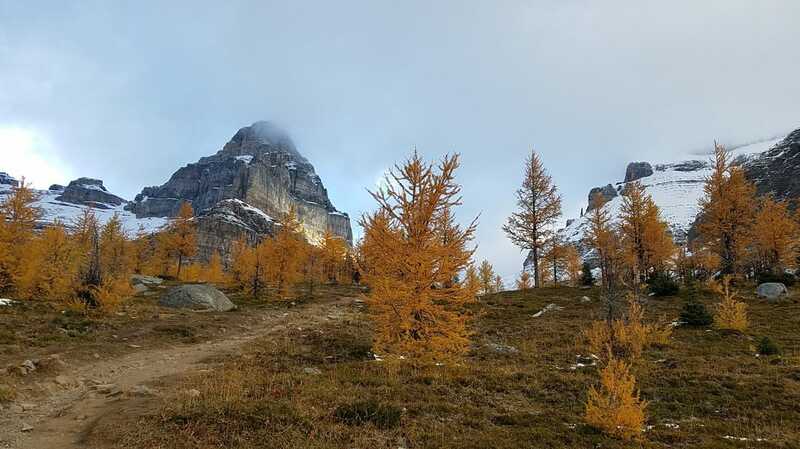 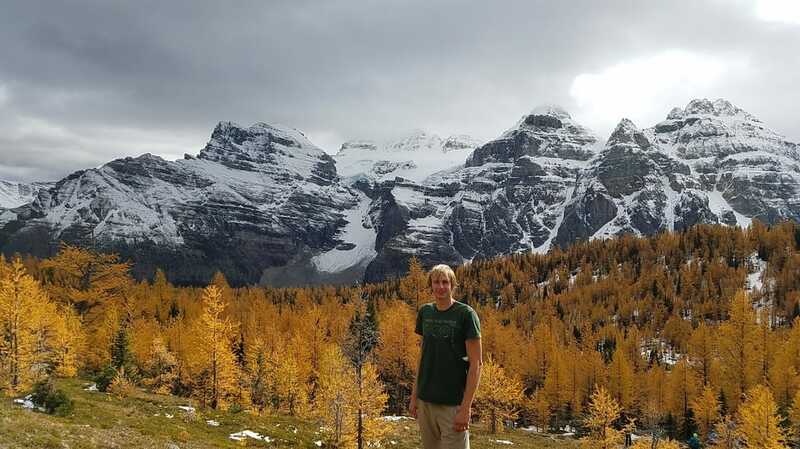 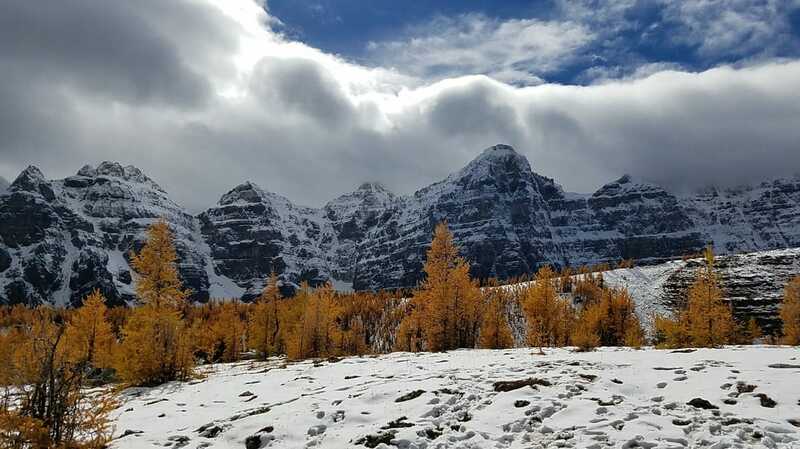 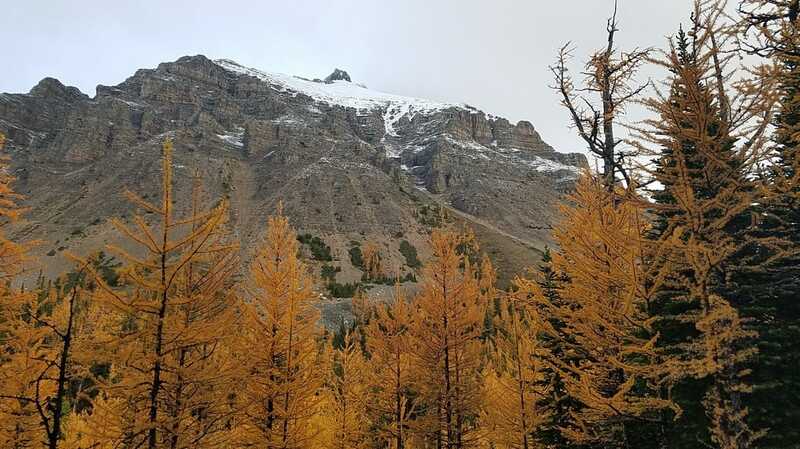 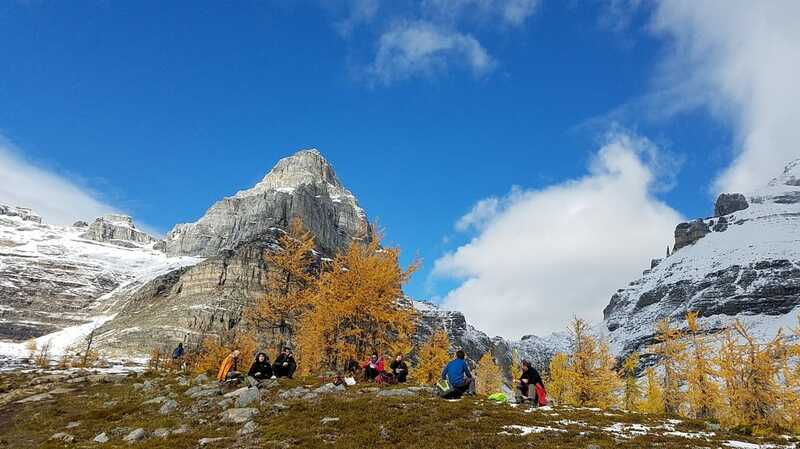 I didn't actually know that the Banff area had larches like we do in WA, but when I wanted to make an attempt on Mount Temple I saw there was an entire valley full of them! 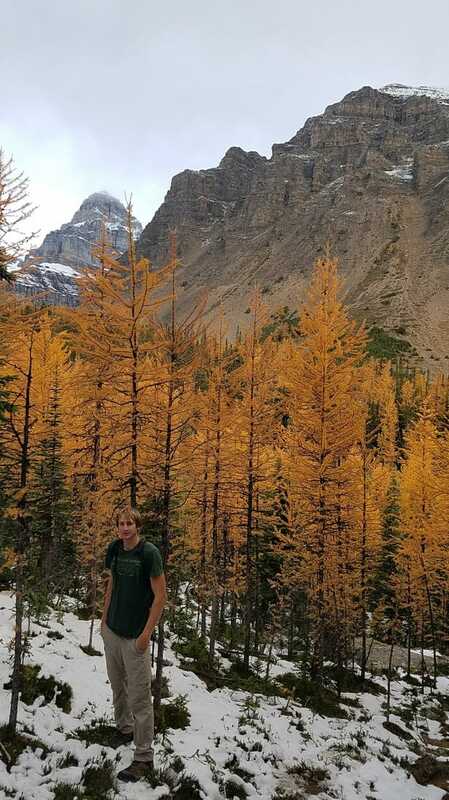 It turns out it's the only place in Alberta with bunches of them. 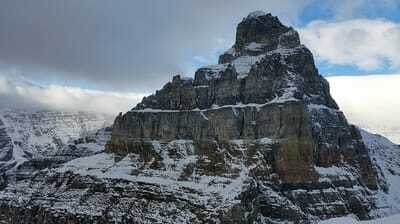 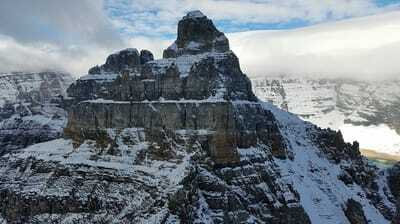 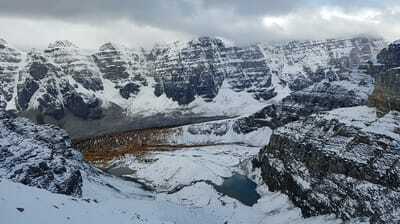 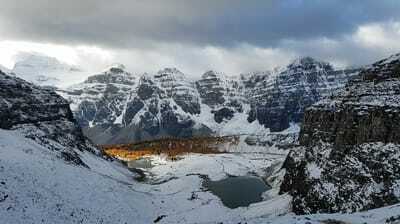 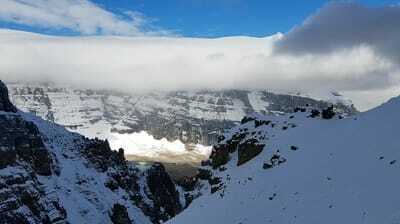 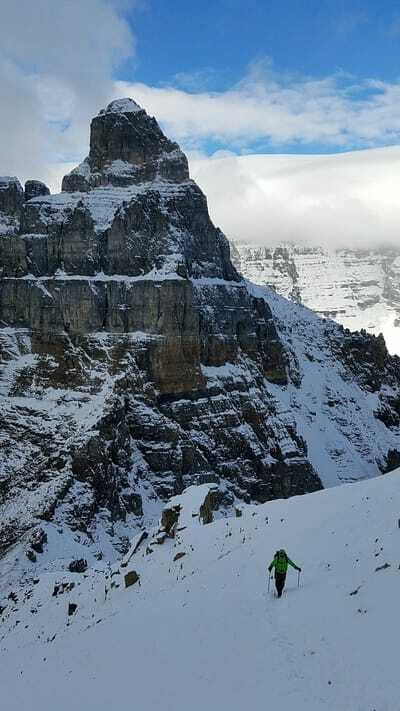 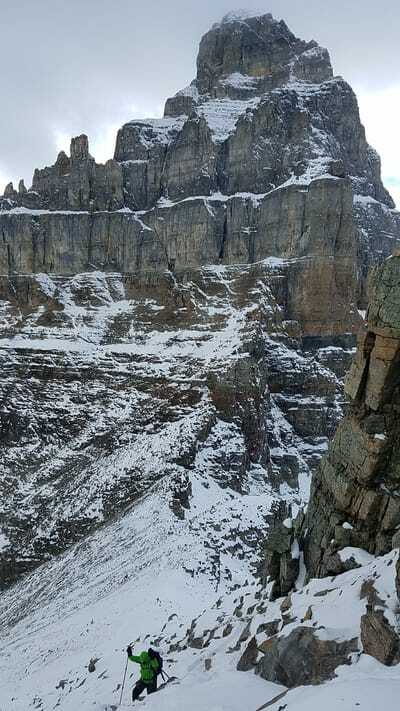 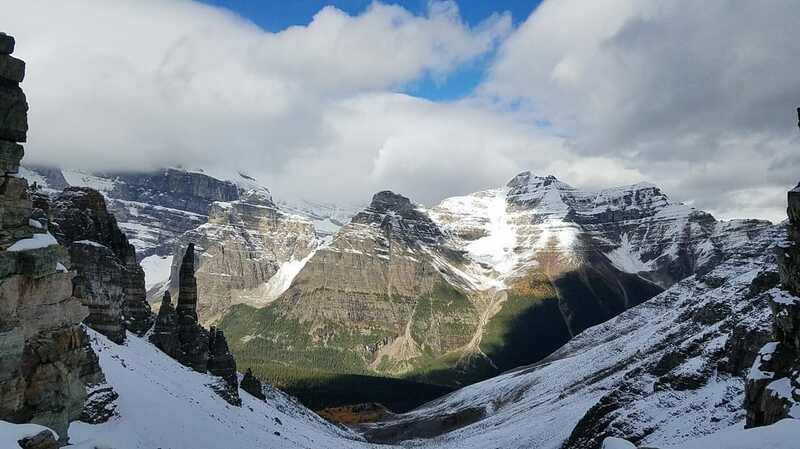 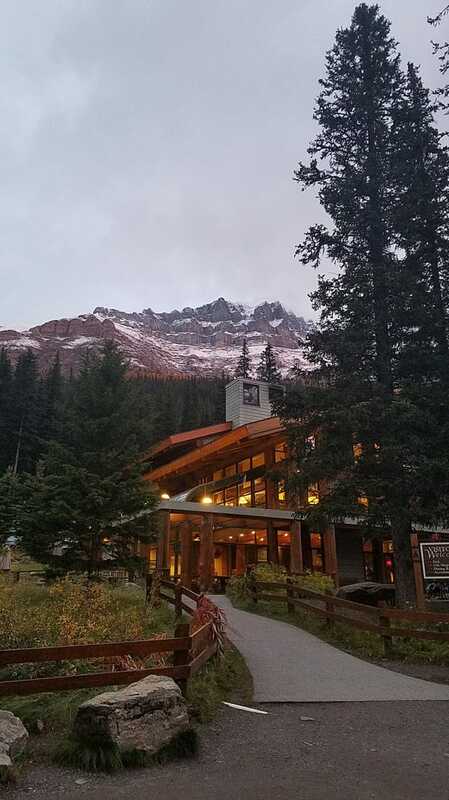 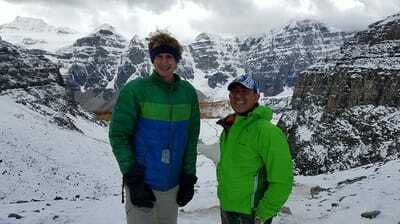 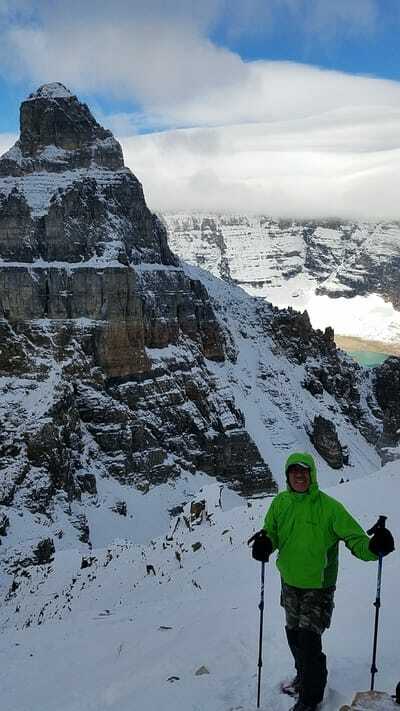 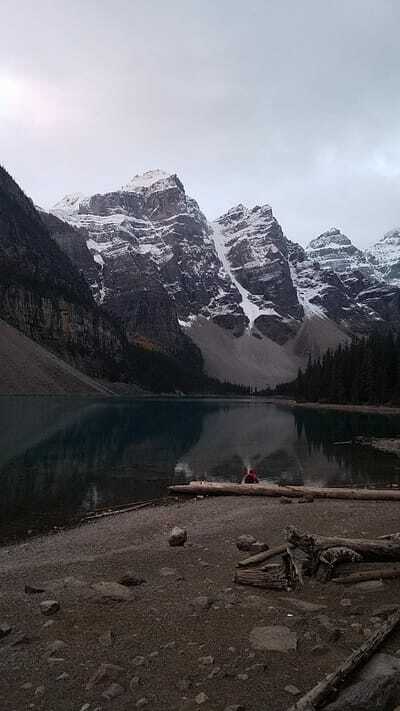 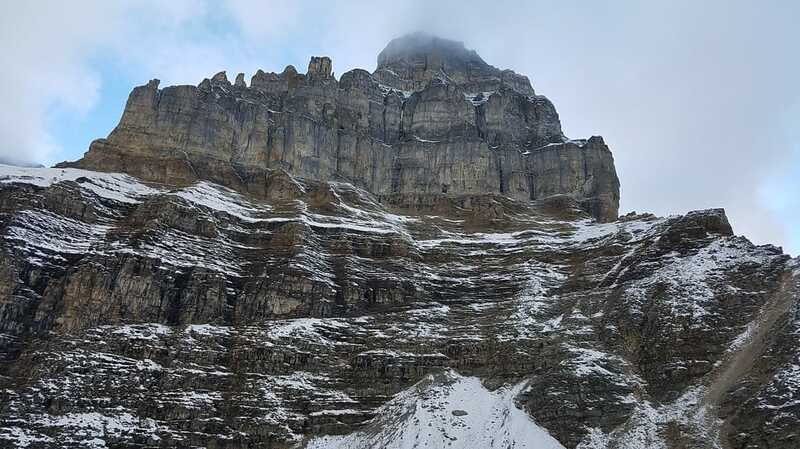 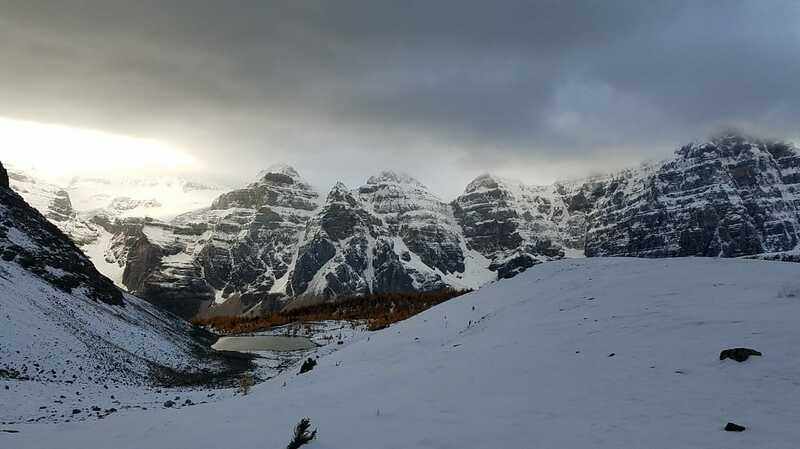 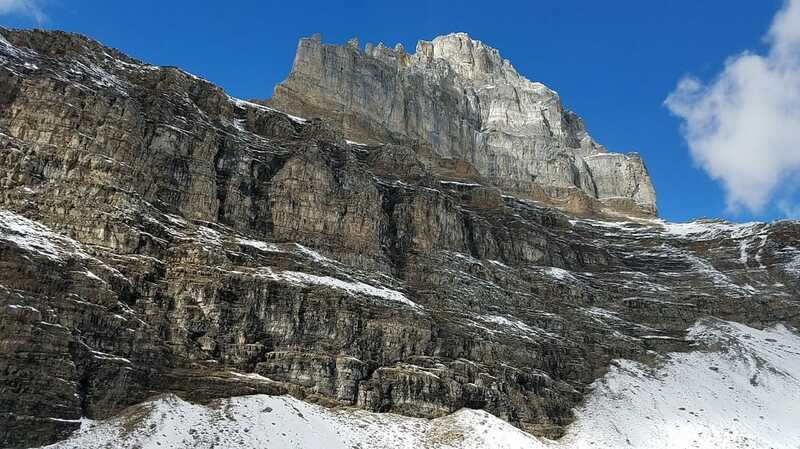 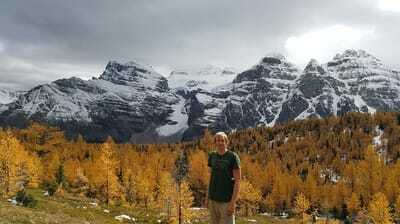 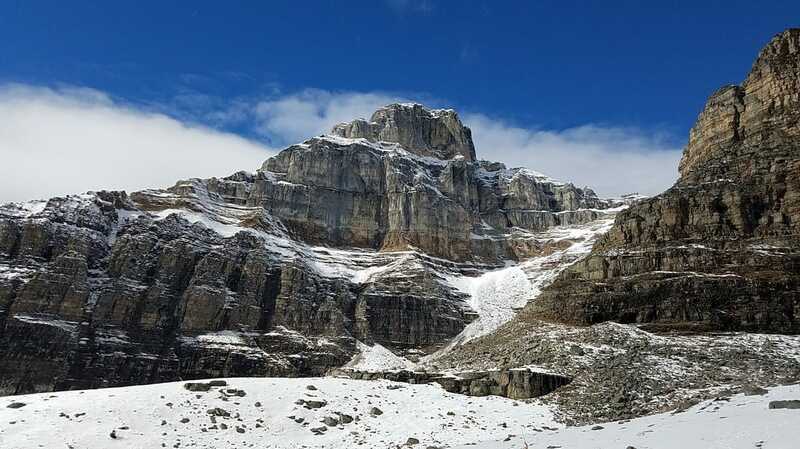 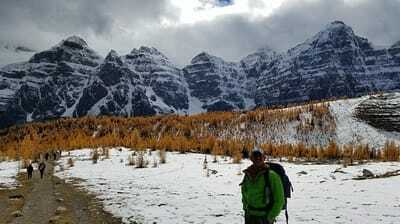 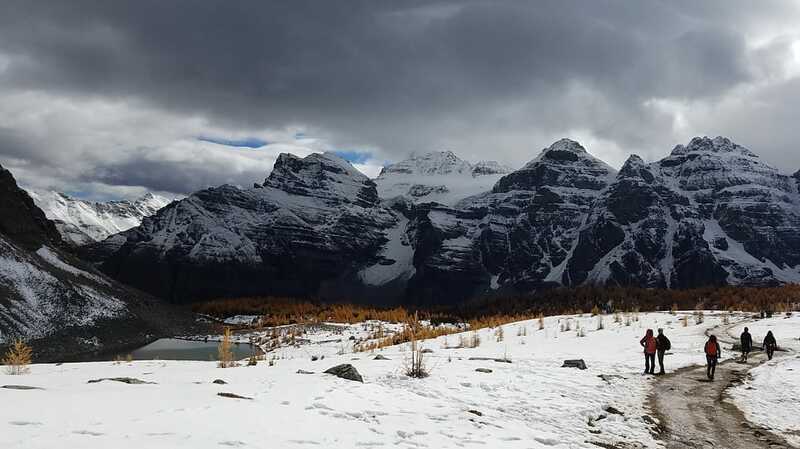 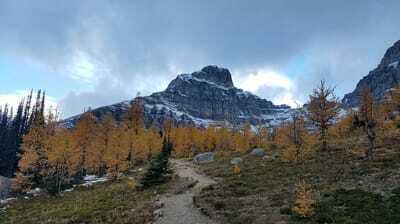 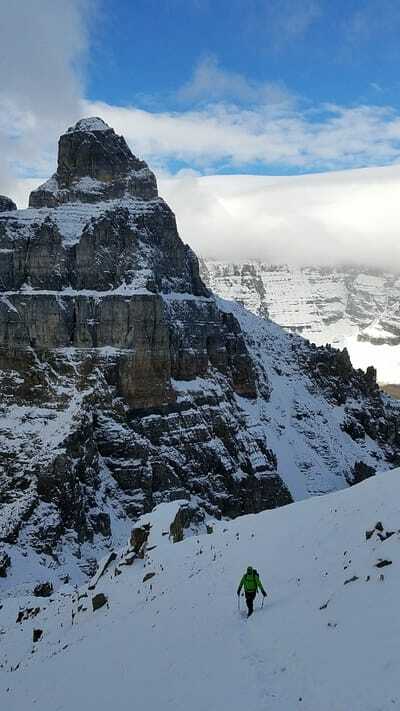 So I met up with a guy from Calgary early in the morning and we carpooled to the Moraine Lake trailhead, and started up the very popular trail to Larch Valley. There was some low level clouds blocking the sunrise, but as we got higher, the clouds started to thin out, and as we first emerged into the sea of larches, I was blown away! 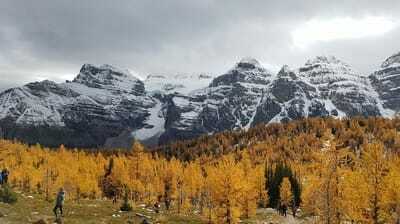 This was the best display I had ever seen, so we took our time hiking up through the valley and I lost count how many photos I took. 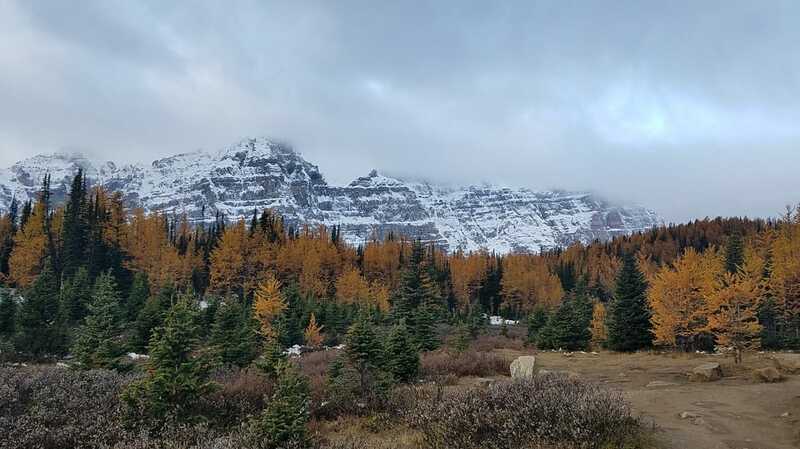 The color was at its peak! 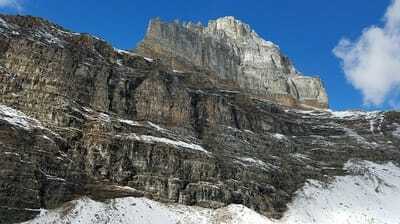 We made it above treeline and passed below Eiffel Peak on our way to the pass at the saddle between Eiffel and Temple. 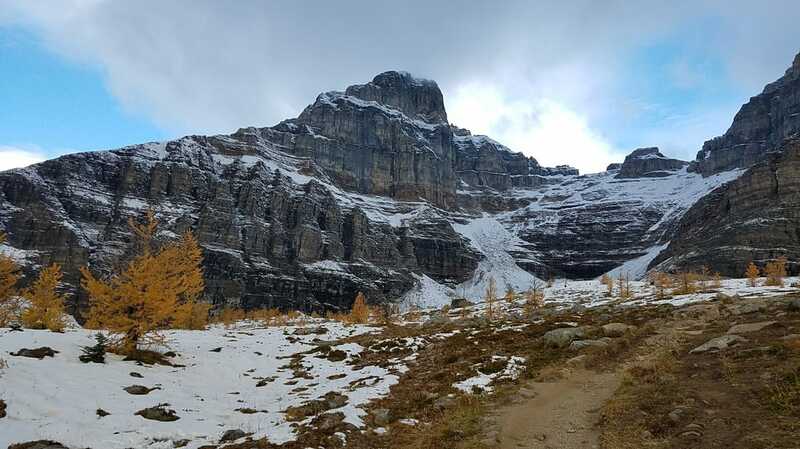 By this point the trail was still visible, but covered in packed snow. The rest of the surrounding landscape was blanketed in a small layer of fresh fall snow, and was absolutely beautiful. 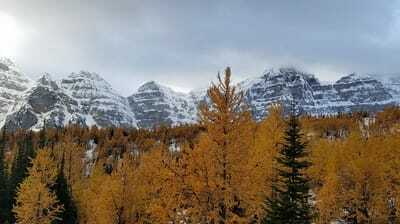 Mount Temple was still shrouded in clouds, and I didn't think it would clear at all throughout the day, but we still continued on. 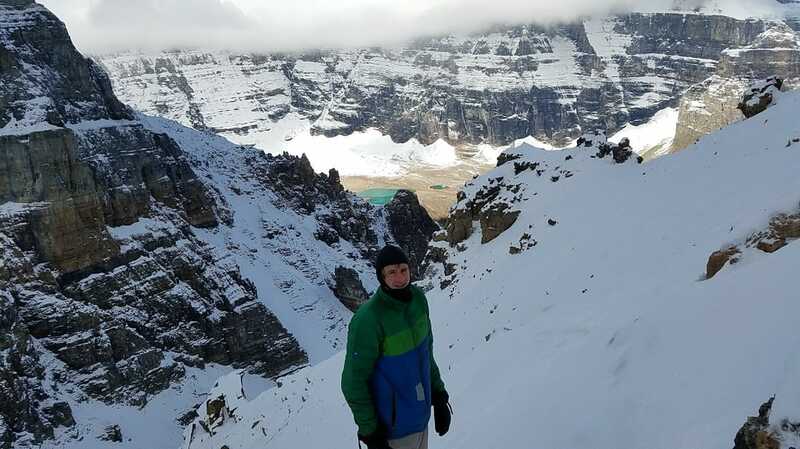 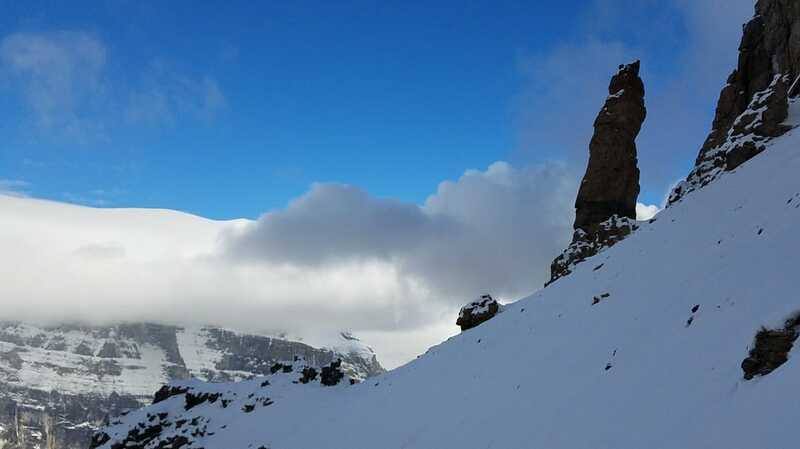 We started up the steep boot path leading up the standard route, where we quickly hit some deep snow. 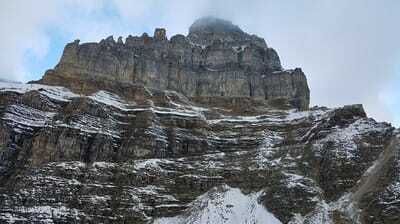 It didn't take us long to decide to turn back however as we entered the clouds and the wind picked up. I wasn't interested in topping out if wen weren't going to see anything, so just over 2,000 feet below the summit we turned around. 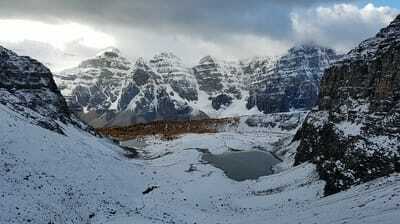 When we got back to the pass, we were no longer the only ones there! There were now over a dozen people, I noticed a long line of people still on their way up. We ate a quick snack, and began down the trail, helping out some real beginners along the way, who were scared of the ice. 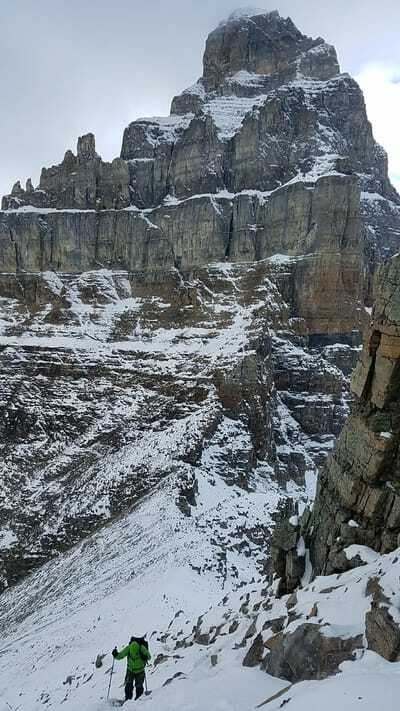 As we descended further, the crowds increased even more to form scores of people, and it became nearly impossible to take a photo without people in it. I guess this hike is popular for a reason though. 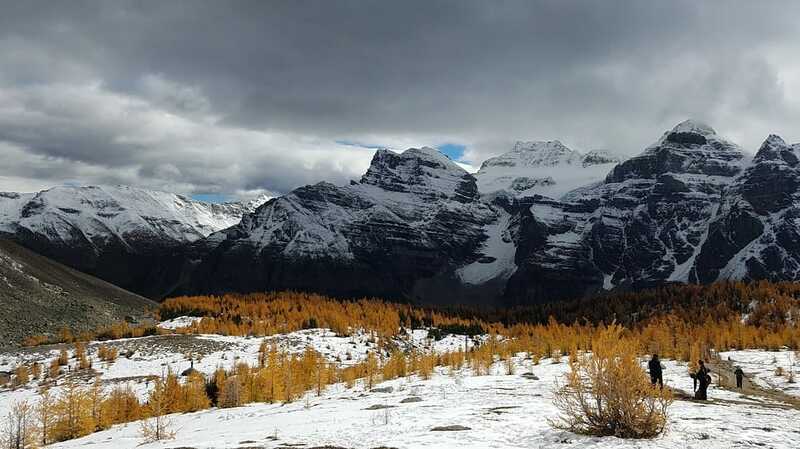 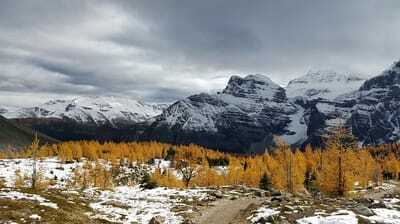 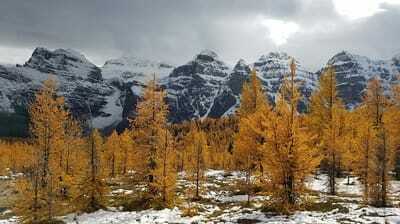 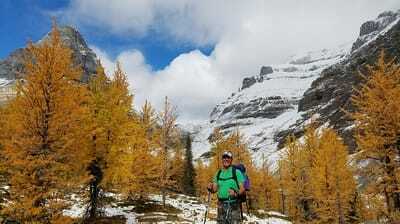 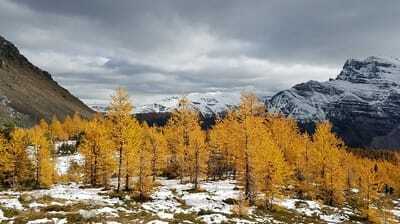 I took a ton of photos since the sun was nopw out, and lighting up the vibrant yellow glow of the larches. By 2pm we made it back to the trailhead and I drove back to Edmonton.